Visiting Austria with your family? 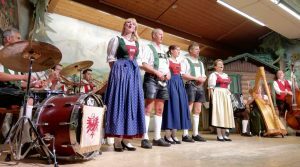 While an Opera in Vienna or a Mozart concert in Salzburg would soothe your soul, no doubt, but a foot-tapping, hand-clapping evening spent singing and dancing with the Gundolf Family in Innsbruck is as much a lesson in immersive culture as it is a riot of fun. Around 40 minutes into a musical and laughter-filled evening with the Gundolf Family, there was little that was unexpected in terms of fun and slapstick dancing. After all, decked in the traditional colourful costumes of dirndls (a country-styled dress usually worn by peasant women in Bavaria, South Tirol and Austria) and lederhosen (knee-length leather breeches worn by men), the various members of this rambunctious family had taken us through a series of foot-tapping country dances and songs already. But that was before the one of the ladies stood centre stage and started singing ‘Die Bless, mei Kuah’, which, according to Google, can be loosely translated to ‘Bless my cow’. What started off as another just beautifully sung country song, was interspersed with the fantastic mooing performed by the artiste and which seamlessly segued into a yodel each time. Unsurprisingly, this brought the house down every.single.time, and the kids would just squeal in delight. I can understand that such a feat can be difficult to imagine, which is where this video helps. However, nothing beats witnessing it live. Slotted as the No. 1 cultural attraction by many traveller websites, the experience does live up to the promise. 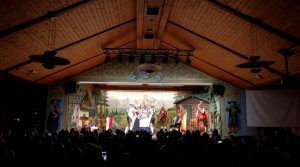 The show, which is in its 51st year, is a great way to immerse oneself into the local Tyrolean culture, and my musician parents were enraptured, although occasionally ‘offended and amused’ as the some of the dances – such as the jealousy dance or the Schuhplattler, the courtship dance – turns a bit teasingly risqué. Not really! But, as I said, this show is equally fun across ages. Now, travelling with children can be as challenging as it can be wonderful. For those raising a sceptical eyebrow or two, I must add the disclaimer that I have no kids of my own but I have travelled with cousins, nieces and nephews often enough to experience both ends of the spectrum. Trying to keep them energetic and engaged, while (being the conscious elders) making them aware and appreciative of local cultures. The fact that this performance is a hit with children and adults alike was evident in the grinning young ’uns taking to the tables to match the dancers on stage, step by step, along with the flushed cheeks and frequent guffaws of the elders. Of course, the latter could also be partly due to the generous mug of complimentary local beer served at the beginning of the show. 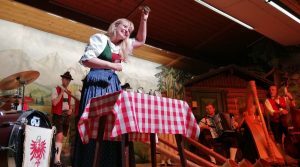 They also have a three-course traditional Austrian dinner, which visitors can choose. While there, it did strike me that a reservation for that would have been nice, but we eventually had to settle for late-night McDonald’s drive-in meal. But we were still high on Austrian music, so that made up for it. Interestingly, the family, with additional musicians, performs songs that date back to the 18th century. It was apparently in 1773 that the mountain farmer and musician Franz Gundolf founded the first village brass band in Häselgehr in the Lech Valley, in Tyrol. But it was his grandson, Franz Paulo, who really took the musical tradition ahead by building his own zither (a stringed musical instrument that many Indians would relate to as a version of the santoor or swarmandal) and making a living teaching music and playing at a guesthouse in Innsbruck. Each of his eight children went on to learn various instruments and they all started performing as a family, not only locally but also across Europe. This was in the 1950s. Since then, the Gundolf family has grown each generation, and so has their fame across the world. 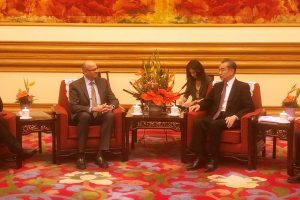 During the 1.5-hour show, we were treated to a range of instruments, including the zither, the alphorn (which is reminiscent of the Tibetan long horn, dung-chen), the harp and all sorts of cow-bells. Yes, even cow-bells can make for quite an interesting music! We also enjoyed the Tiroler Holzhackertanz (woodchopper’s dance) by the four really energetic men, and not to forget the very fast-paced Schuhplattler that got many of us on our feet. But the really heart-warming gesture was the finale, when members of the Gundolf family would sing the national songs of each and every country who were guests there. When we entered the Sandwirt Restaurant – which is where the show is held – that evening, we were asked which country we belonged to. Little did we know that other than the initial welcome of Namaste, such a treat awaited us at the end. It was so amazing to sing ‘Saare Jahaan Se Accha’ with all the 50-odd people present there. My mother approved that I was wearing the traditional salwar-kurta just for this occasion, and nothing beats that! So yes, if you’re in Innsbruck, do factor in an evening with the Gundolf family, because it’ll be surely one to remember.